Treehouse World proudly hosts workshops to teach the art and craft of treehouse construction every year. What better place to gather among other treehouse professionals and aficionados to swap arboreal adventure stories! 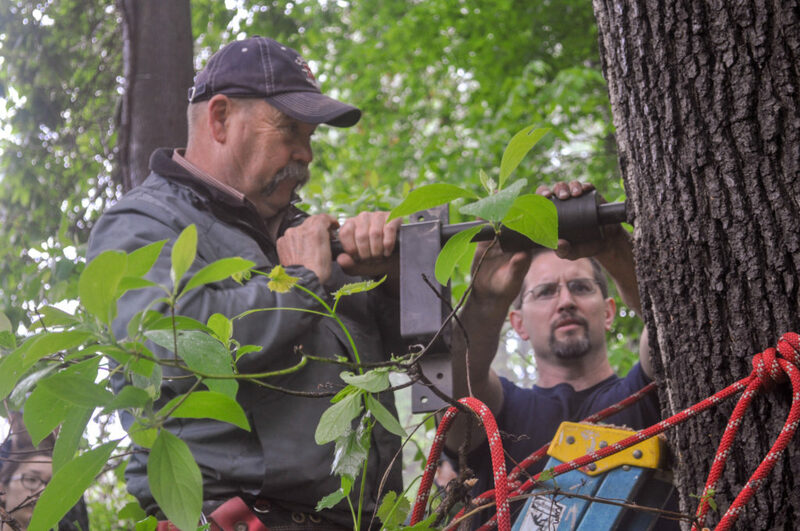 The workshops will cover the familiar basics of arboriculture, engineering, and tips and tricks of the trade. We will also be adding to the awesomeness at Treehouse World by building new and exciting tree structures. So pull up a log or join us out on a limb, whether you want to learn how to build a safe & tree friendly backyard perch or to stay current with the best practices in tree house building today. Participants must be a minimum age of 12 years old. Cost is $579.00 per person. Includes workshop, full meals, & one of our famous treehouse t-shirts. We teach treehouse design & construction techniques, tree biology, proper hardware installation, rigging, TAB installation, zip lines & bridges, and other topics per request (to request, make a note on the Registration Form). The hands-on project is still to be determined, but it will include a tree platform installation and something else, such as a bridge, another style of platform, or whatever is the most interesting or useful activity we can imagine. If you would rather get more experience with us by extending your stay through Monday, then please indicate that on your registration form. If we get enough interest, we will add Monday May 20th as an additional day for $125/day/person. If you would rather get more experience with us by extending your stay through Monday, then please indicate that on your registration form. If we get enough interest, we will add Monday September 23rd as an additional day for $125/day/person.